Audible is a popular digital audiobook seller that is owned by Amazon. It’s got all kinds of programing and they helped making Audible currently the biggest downloadable audiobook producer in the world. A lot of people download audiobooks from Audible. If you’ve purchased and downloaded audiobooks from Audible before, you would know that they’ve got DRM protections on them and you can only play those audiobooks with iTunes or Audible’s own program. But in real life, you might want to listen to the audiobooks you download from Audible with different audio players or on different devices. But the DRM protection on them would prevent you from doing so. So if you want to play the protected audiobooks with different audio players or on other mobile handsets, you are going to have to remove the DRM protection from the Audible audiobooks first and convert them to ordinary audio file. The audiobooks you download from Audible’s website are in either AA or AAX formats. 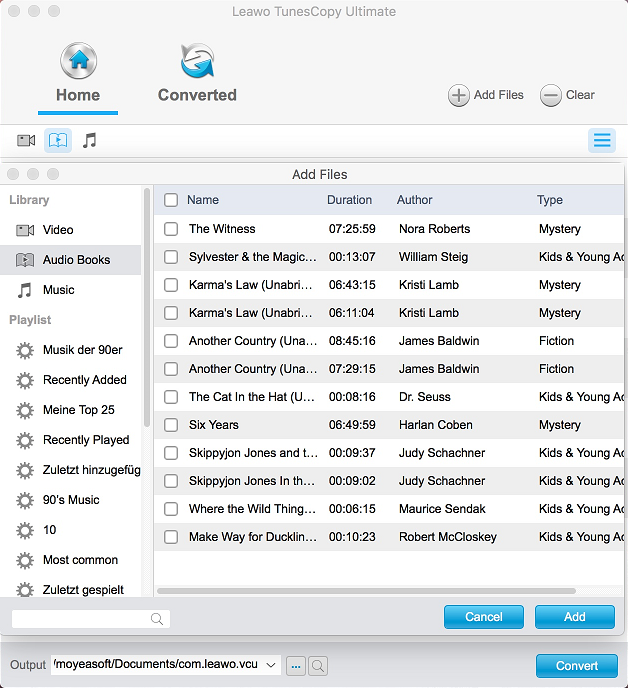 To convert AAX audiobooks to MP3 on Mac, there is actually a program that you can use. Below are the instructions for converting AAX to MP3 Mac users could refer to. AAX is a common Audible audiobook format and usually AAX files contain DRM protections. To convert it to MP3, we are going to need a program that can remove the DRM protection from the AAX audiobooks. Here I would show you a program that can remove DRM from AAX audiobook and convert it to MP3 on Mac. The program is called Leawo TunesCopy Ultimate for Mac. As is mentioned before, it can remove DRM from Audible audiobooks, but that’s only one small part of its capabilities. The program was first developed to help iTunes users to remove DRM from iTunes music, TV shows, movies and audiobooks on Mac. And later the Audible audiobook DRM removal feature was added to the program and now users can use it to remove DRM from Audible audiobooks on Mac as well. Here’s how to convert AAX to MP3 Mac users could try. Step 1. Import AAX audiobooks to Leawo TunesCopy Ultimate. Open Leawo TunesCopy Ultimate on your Mac. 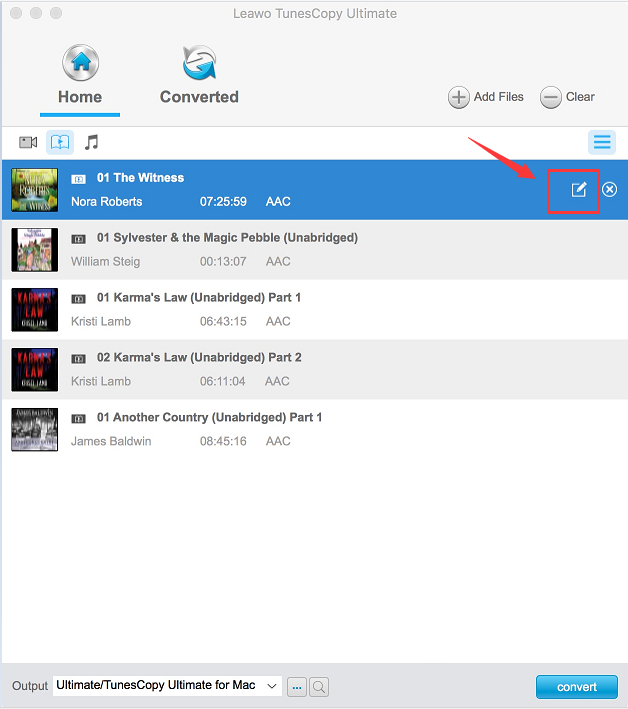 To add the AAX audiobooks you want to convert to MP3 to the program, you can click the Add Files button or directly drag and drop the source AAX audiobooks to the interface of the program. Note: When importing source AAX audiobooks by clicking the Add Files button, you might be asked to get the authorization from Audible. Just sign into Audible with your Amazon account and the authorization will be done. If you directly drag and drop the source AAX audiobooks to the interface of the program, then you won’t need the authorization from Audible.com. This step is optional. If you want to change the audio parameters, just select the file that you want to change, and then click on the Edit button on it. The audio parameters that you can adjust include BitRate, Sampling Rate and Channels. Step 3. Set up the default output directory. The output directory is where the converted AAX audiobooks are going to be saved in. The default output directory is shown in the bottom left-hand corner. To set a new directory, just click on the “…” button next to the directory box. Step 4. Start removing DRM from your AAX audiobooks and converting them to MP3. When you are done with the above 3 steps, you are basically ready to start the DRM removal and conversion process. To start the conversion of AAX to MP3 Mac, just click on the Convert button at the bottom right corner of the interface. That’s how to convert AAX to MP3 Mac users could try. After the whole process is finished, your AAX audiobooks will be converted to MP3 with no DRM protection and you will be able to play them freely with other audio players or on other mobile devices as you like.